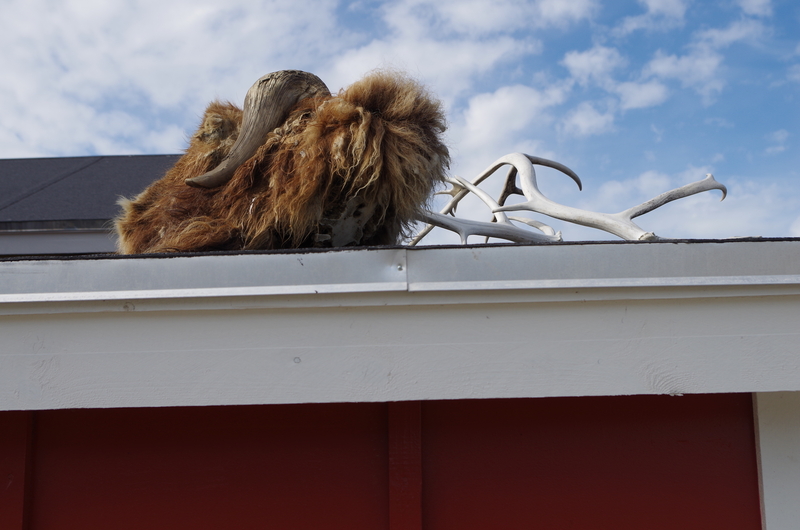 A muskox decorates the roof of a house in Kangerlussuaq. © Mia Bennett, August 2014. “I just had muskox Thai curry at the only restaurant in town,” I messaged my friend after dinner one night in Kangerlussuaq at the Polar Bear Inn. “Greenland has restaurants?” she replied. Yes, Greenland has restaurants. This isn’t so surprising once you consider that 57,000 people inhabit this Arctic island. Those restaurants often serve muskox, a staple of Greenlandic cuisine and an important element of many local economies in this corner of the world. In Kangerlussuaq, the furry bovine is even the mascot for the annual “Running of the Moskus,” a 5K/Half Marathon whose proceeds benefit the local school trip to Copenhagen. Muskox originally lived in northern Canada and northern Greenland, yet the species has been reintroduced to southern Greenland, where it now thrives . It’s common to spot the animals from the main road up to the ice, grazing together in small herds. 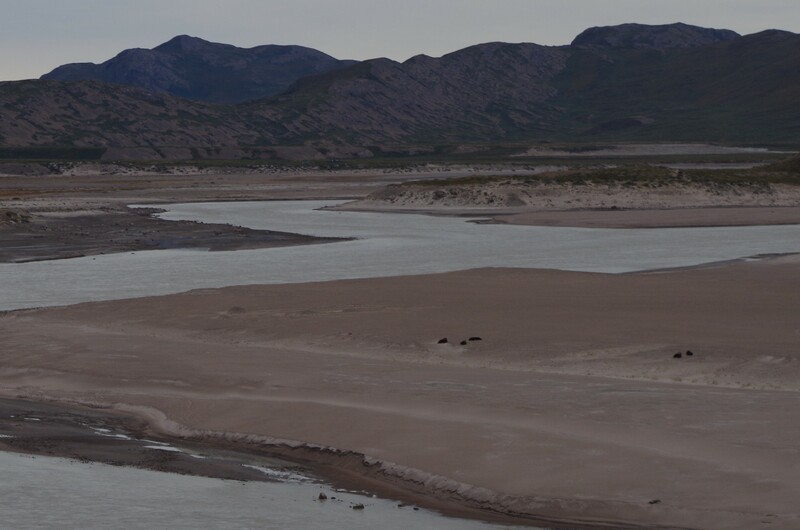 Five brown lumps, actually muskox, sitting on the banks of the Watson River. © Mia Bennett, August 2014. Fishing and mining are often the first things that come to mind when discussing Greenland’s economy, for they are the sectors that bring in the most money. Fishing, mostly of shrimp and halibut, generated 89% of exports in 2010. Mining, which resumed in 2006, only constitutes a small amount of exports. Megaprojects like aluminium smelters and iron ore mines grab all the headlines even though more local, artisanal sectors like hunting and knitting – both tied in many instances to muskox – are still of vital importance. Hunting, in fact, employs 10 percent of the population directly and indirectly . 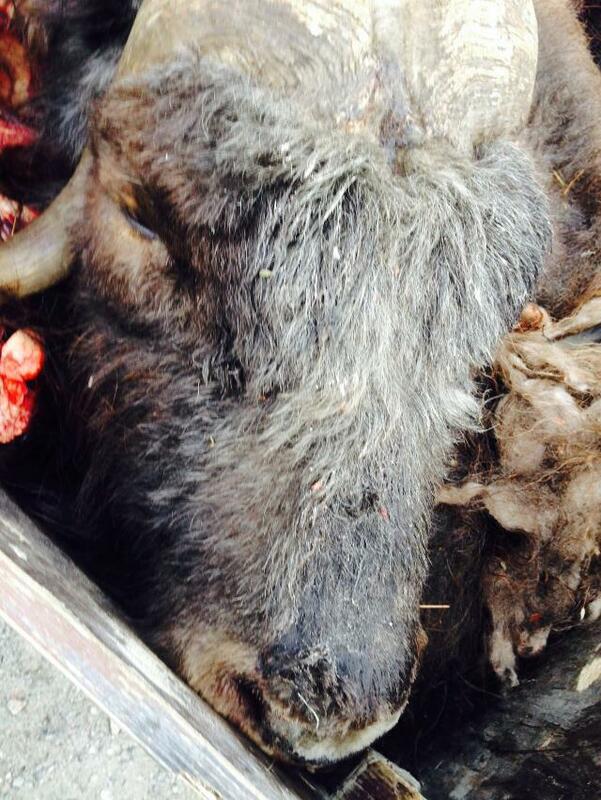 A dead muskox hunted by trophy hunters in the back of a truck. © Daniel Nichita. In Greenland, hunting takes place under the categories of both subsistence hunting and trophy hunting. Hunters from Denmark, the U.S., Russia, Poland, and Germany, among other countries, pay up to $8,650 to companies like Greenland Outfitters for the privilege of hunting and keeping an animal head. The price which includes the fee for the “trophy,” lodging, flights, food, etc. With trophy hunting, the parts of the body that the hunter doesn’t keep are often used for food or fur in Greenland. Nowadays, the government prohibits the pursuit of muskox or caribou from an ATV, making it more difficult to provide luxurious trophy hunting trips. This restriction didn’t sit well with some hunters who have felt at odds with the government, especially since pro-mining Siumut became the largest party in parliament (though shy of holding a majority) in 2013. With Greenland’s new tourism slogan “Be a Pioneer,” it’s clear that the government wants to look forward to modern, industrial development schemes like mining rather than backward to hunting and fishing. 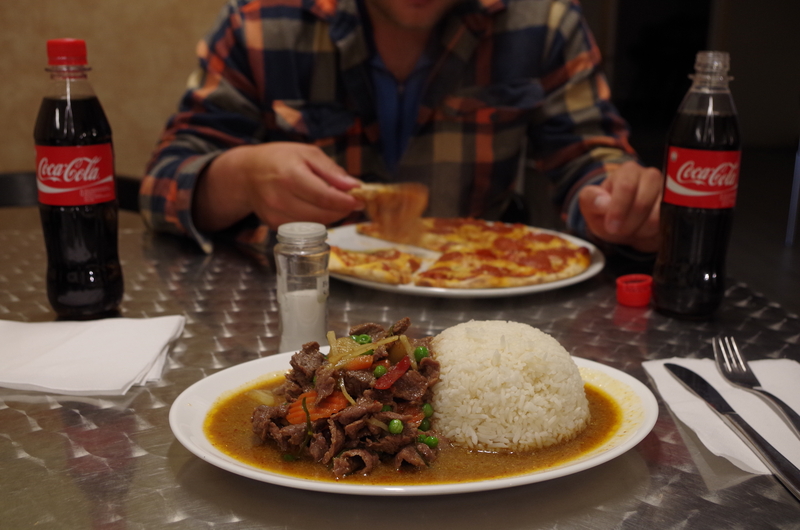 Greenland in a nutshell: Muskox red curry, a pepperoni pizza, and Coca-Cola bottled in Nuuk. © Mia Bennett, August 2014. Muskox meat is sold to restaurants like the Polar Bear Inn in Kangerlussuaq, which feeds locals, scientists, and members of the military staying in town, and also the high-end restaurant Roklubben (Row Club) on the shores of nearby Lake Ferguson, which caters to the more well-heeled tourist crowd. The Polar Bear Inn is run by Thai people, originally from a village northeast of Bangkok . The fact that Thai people are running a restaurant in the Arctic isn’t that unusual, for there is also a large Thai population in Svalbard, the archipelago north of Norway. The Polar Bear Inn’s restaurateurs have adapted their home cuisine in order to work with Greenland’s limited provisions. Most of the vegetables are frozen, the rice is plain, never coconut, and you can forget your Thai iced tea. 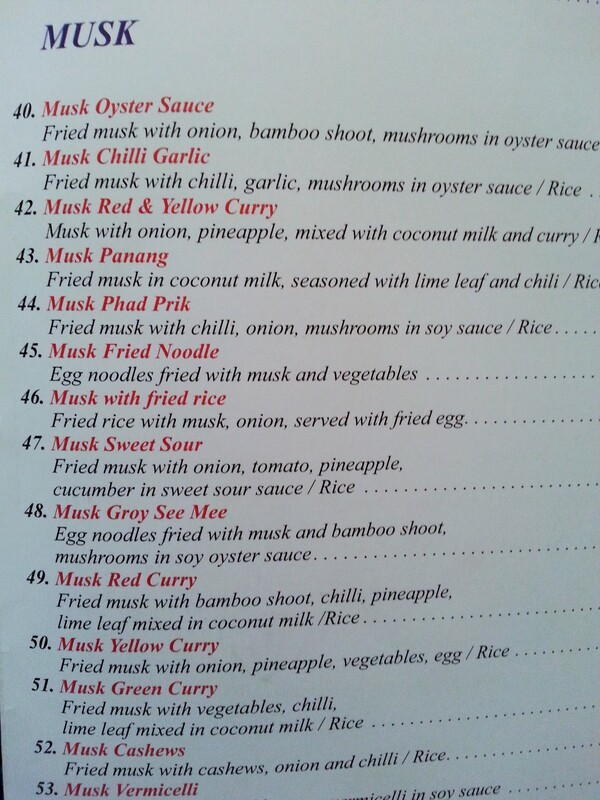 But on the menu, next to the typical “Chicken,” “Beef,” and “Shrimp” sections is the “Musk” section, which features delights such as muskox curry and muskox tom yum soup rather than the boring old fare of pad thai and chicken satay. You can choose between the standard options of red, green, or yellow curry – though personally, I found the muskox panang to be a real winner. Thai food is not all that the Polar Bear Inn serves. No town in the world is a town without a pizzeria, even in the Arctic. So naturally, the restaurant also dishes out personal-size pizzas with all sorts of toppings, including muskox. The muskox supreme seemed to be a favorite with the visiting Danish soldiers. A strange combination of thinly sliced muskox, gorgonzola cheese, canned mushrooms, peppers, and chili sits atop a circle of pizza dough. The Guardian recently published an article on Britain’s crimes against international cuisine, but I think it is high time for a follow-up story on the abominations of Greenlandic cuisine, the muskox supreme being one of them. 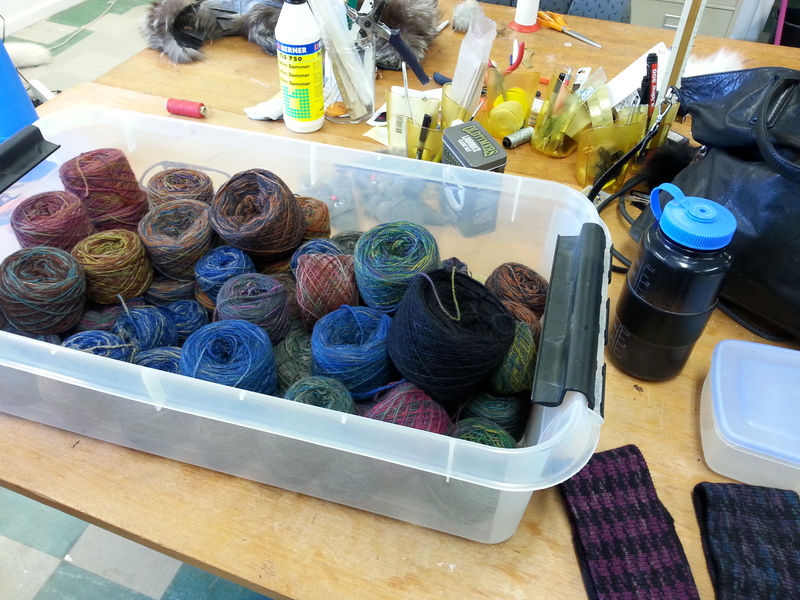 Dyed muskox wool on a workshop table and two headbands in the bottom right. © Mia Bennett, August 2014. Aside from being chopped up into curries or sliced on top of pizzas, muskox is also used for its wool (qiviut). 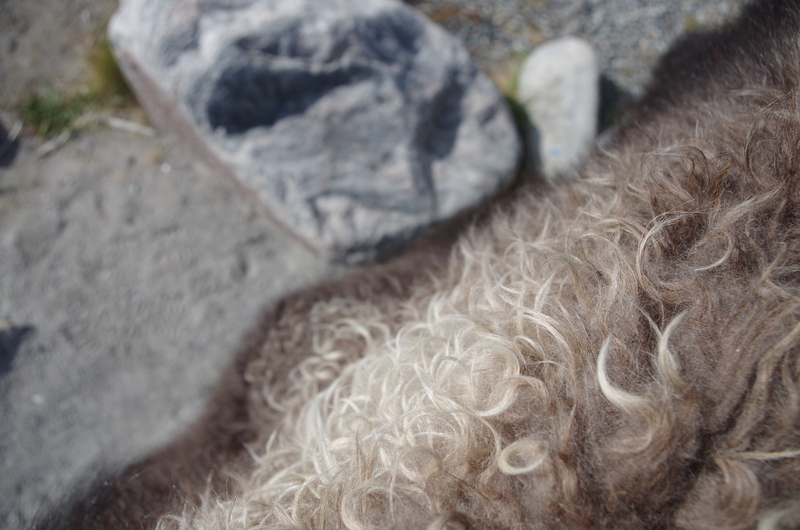 The brown, fluffy, and incredibly soft fiber is cleaned, shipped to Denmark, where it is turned into yarn, and then sent back to Kangerlussuaq. There, a local artist dyes or hand-paints it, with the colors inspired by scenes from Greenlandic nature. A red, orange, and purple painted yarn recalls the sunset, while the pinkish-purple yarn evokes the niviarsiaq, a flower that grows throughout the tundra. Sweaters, hats, headbands, and mittens are just some of the muskox wool accessories you can purchase at stores like Niviarsiaq. A hat costs about DKK 500 (USD $88 USD), while a sweater goes for about DKK 3000 DKK (USD $528). Fluffy muskox fur. © Mia Bennett. 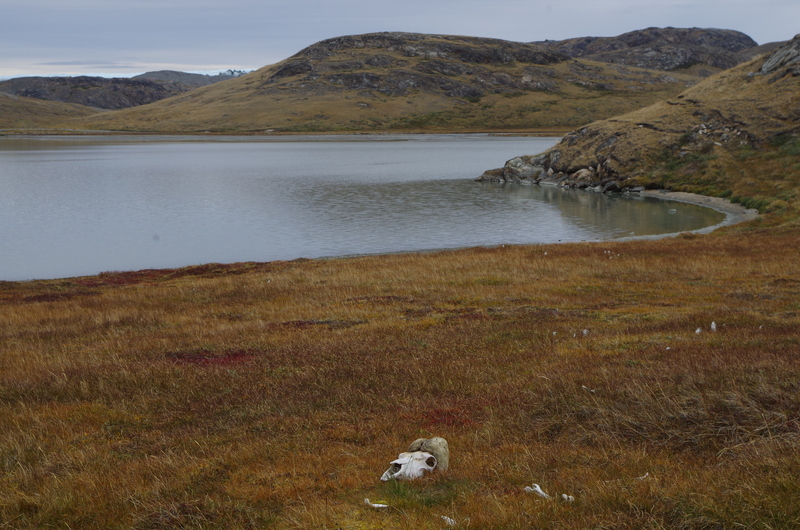 Having only visited Kangerlussuaq, I can’t say if the muskox economy is as prominent elsewhere in Greenland. But I can say that muskox is not the only animal product sold in Kanger. Dog fur is turned into mittens. Bone is carved into miniature toy dogsled sets. 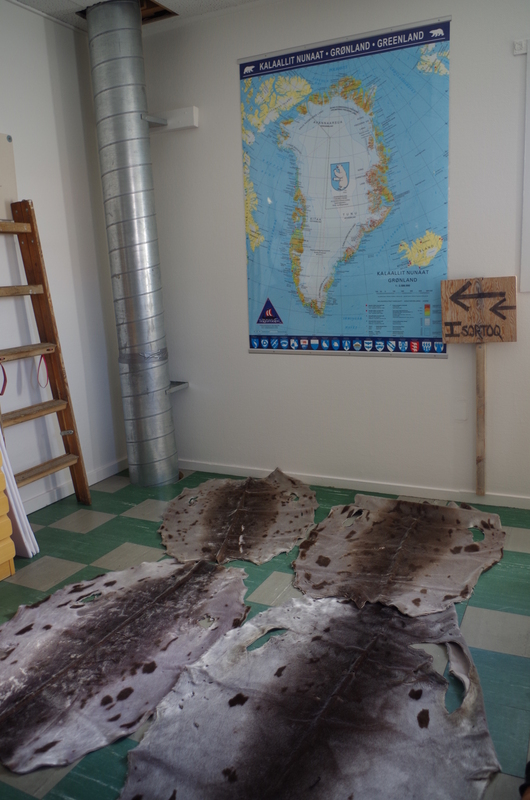 Raw caribou meat is sometimes sold on a tarp right outside the local outlet of Pilersuisoq, the national grocery store chain. (In fact, on second thought, it may be better to say that in Greenland, no town is a town without a Pilersuisoq. Just look at their incredible store locations map – yes, they are even in Siorapaluk, the world’s northernmost inhabited settlement, which is even north of Thule/Qaanaaq.) Sealskin is turned into leather for boots and coats, a product whose export has declined by 90% after the European Union banned its import in 2010 despite limited exemptions for certain Inuit production. The ban has caused significant hardship for people who once depended on sealskin products for part of their income. 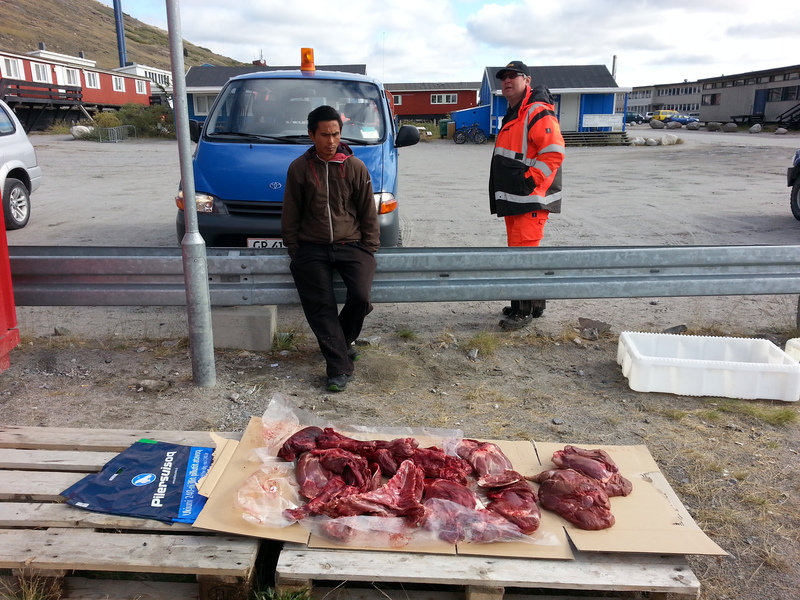 Caribou meat for sale outside Pilersuisoq. © Mia Bennett, August 2014. While the EU bans imports of seal products, it hasn’t outright banned imports of products like gold, diamonds, and rubies, even though there are just as many concerns over their provenance and production. Mining causes large-scale devastation to the landscape and its flora and fauna in a way that is arguably more harmful to the overall health of the environment than sealing. Under the current system of global capital, industrial processes and mega-projects that have the capacity to both generate (and lose) huge sums of money, such as mining, tend to triumph over small-scale, lower-return sectors like hunting and sealing. The irony of discourses surrounding Arctic development is that mining can be marketed as sustainable while sealing is considered barbaric. Sealskins awaiting processing. © Mia Bennett. The Arctic Council’s newly formed sub-group, the Arctic Economic Council (AEC), is having its inaugural meeting in Iqaluit, Nunavut, Canada today and tomorrow. Already, Canada, whose priority as Arctic Council chair is “development for the people of the North,” views the AEC as one of its leading accomplishments during its chairmanship, which will end in spring 2015. Looking at the list of representatives from each of the Arctic Council member states and permanent participants who will attend the meeting, it’s clear that mining, oil and gas, and shipping all are well-represented, while truly renewable and sustainable sectors are under-represented. When many of the people living in the Arctic – those employed by the muskox economy, the caribou economy, or the seal economy – aren’t able to attend the meetings where dramatic changes to their land and resources are discussed, there is a problem. Mining companies like Baffinland and Agnico-Eagle may be headquartered in Arctic countries, but their main offices are in the southern reaches of those countries in places like Toronto. What’s more, these global corporations are footloose: if their investments in mines in the Arctic don’t work out, they can move to Africa or South America, whereas a Greenlander cannot. While plans for mining forge ahead, the muskox economy is relegated to a smaller and smaller corner of the tundra. The end of the muskox economy? © Mia Bennett, August 2014. Source: NOAA, Arctic Report Card. Source: Greenland Representation to the EU, Brussels. In case you were wondering, Kanger’s two Thai restaurateurs escape the cold by going home once a year, which is probably not too arduous a trip thanks to the direct flight from Kanger to Copenhagen, and then the non-stop Copenhagen to Bangkok long-haul flight, offered by both Thai Airways and SAS. Thanks for your comment, John. I think the current population of muskox descends from a population that lived in Canada and Greenland, although you are correct in stating that they originally migrated from Alaska (and previous to that, Siberia). The source I am using is http://www.arctic.noaa.gov/reportcard/muskox.html. I will include the term qivuit – thank you!